This is an outstanding starter activity that will get your students engaging in the key words for the topic titled 'Animal Sexual Reproduction'. This is an outstanding starter activity that will get your students engaging in the key words for the topic titled 'Gestation & Birth'. This is an outstanding starter activity that will get your students engaging in the key words for the topic titled 'Growing Up'. This is an outstanding starter activity that will get your students engaging in the key words for the topic titled 'Reproductive Organs'. This is an outstanding starter activity that will get your students engaging in the key words for the topic titled 'Becoming Pregnant'. This resource bundle includes 20 fun and interactive word searches that incorporate essential key words. This acts as a great starter activity for any science lesson. 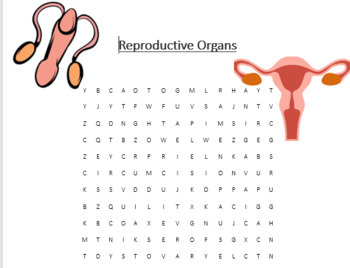 This resource bundle includes 5 fun and interactive word searches that incorporate essential key words for the lessons Animal Sexual Reproduction, Reproductive Organs, Becoming Pregnant, Gestation & Birth, and Growing Up. This acts as a great starter activity for any science lesson.